Are you or someone you love stuck in addiction? Are you tired of simple solutions that just lead to frustration? Breaking Free looks at what are the different pathways to freedom and why so many recommendations just don’t work. 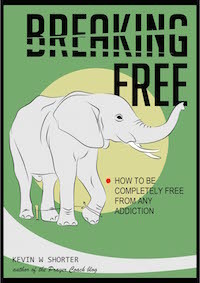 More importantly, Breaking Free looks at the roots that allowed addiction to spring up and how to eradicate those roots to reduce your pull towards addictive behavior. Be reminded of God’s heart for your life. Identify the roots of addiction. Find tactics to remove the addiction. See addiction from God’s perspective. Freedom is available; let’s find out how to apply it. Buy Breaking Free on Amazon for $7.99. The freedom I have experienced since knowing Kevin and applying this principles he shares in this book has radically changed my life forever… I highly recommend this book! This book hits on what so many other books miss – that it is about having a heart change through the transformation of the Holy Spirit before we can ever be truly healed. I must say at the outset that there is more useful information in this short book than I’ve seen in books three times as long. In reading Breaking Free, I discovered that it wasn’t just a powerful tool for those wanting to break free from addiction, but a powerful tool for Christians in general.